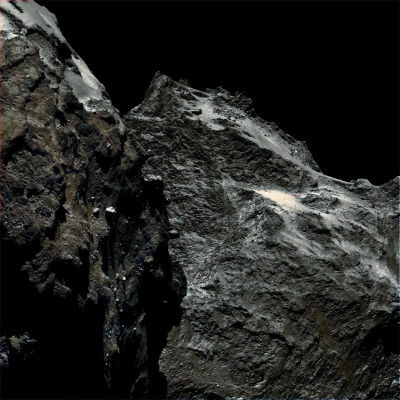 On Aug. 13, 2015 comet 67P/Churyumov-Gerasimenko achieved perihelion--its closest approach to the sun--accompanied by Europe's Rosetta spacecraft. 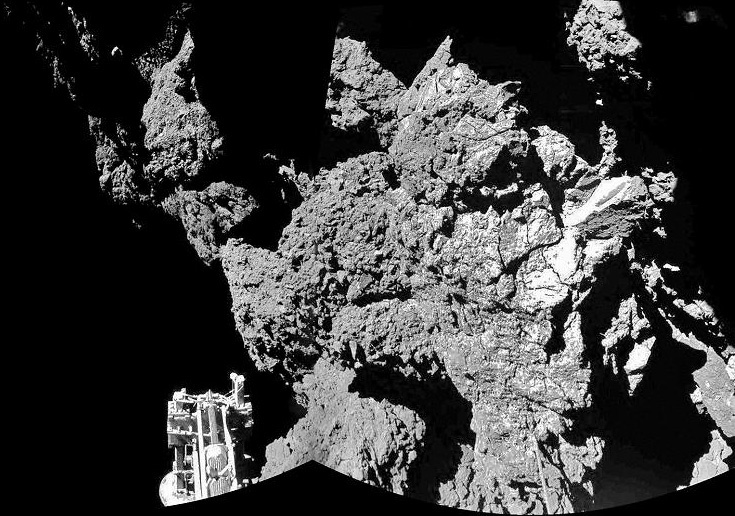 Rosetta arrived at the comet a year ago, and last Fall launched the Philae lander, which detected 16 different nitrogen- and carbon-rich organic compounds, four of which had never been found on a comet before. The composition of comets, in particular their mix of organic compounds, is an intriguing subject of investigation, since one of the theories for the emergence of life on Earth involves the contribution of organic compounds by comets, asteroids, and protoplanets early in the formation of the solar system. When Rosetta launched Philae in November 2014, the small spacecraft became the first ever to land on a comet. And though that landing did not go as planned--systems designed to pin down and hold fast to the comet failed--Philae was able to collect and transmit a useful load of data from near and on the comet's surface before its batteries wound down. Since that encounter, and up to and beyond perihelion on August 13, Rosetta's mission has been to observe the effects of increasing solar radiation on comet Churyumov-Gerasimenko (C-G) over a year that brought it three times closer to the sun. A year ago when Rosetta arrived, the comet was quietly exuding water vapor under the relatively gentle rays of the more distant sun. Picture a cube of ice that you just took out of the freezer and set on the counter: a light breath of vapor rolls gently from the cube's surface. Now, toss that ice cube onto a hot griddle. It sizzles energetically, spewing out jets of steam as the ice vaporizes under the heat. At the time of first encounter, well outside of Mars' orbit, comet C-G gassed off a couple of drinking glass' worth of water each second, a wisp of moisture supplied by its couple dozen square miles of surface area. At perihelion, activity had increased a thousand-fold. The comet was blasting off over 130 pounds of water and almost 500 pounds of dust per second into space. 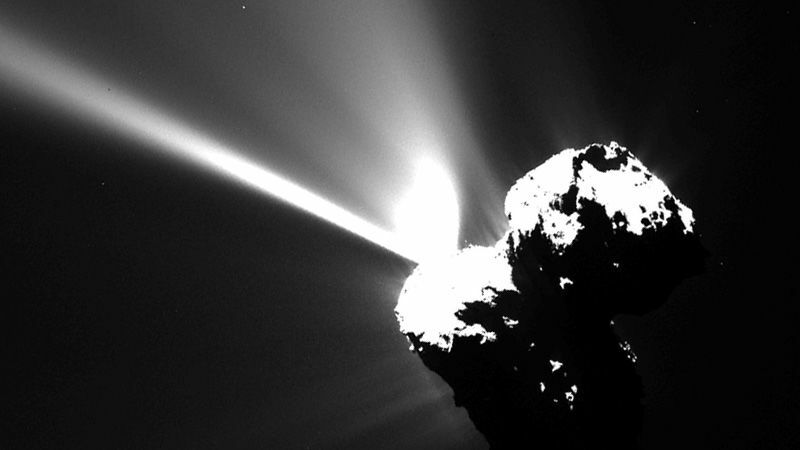 Rosetta captured many images of water and dust jets issuing from the comet over the months. One image in particular, taken only an hour before perihelion, shows a prominent plume bursting out energetically. All of this activity, as ices vaporize and blow away into space carrying dust with it, is what builds up the comet's atmosphere—or coma. In some comets--usually those that get closer to the sun than C-G ever does—this coma is blown by the solar wind into the long, iconic tail we generally associate with the image of a comet. There were hopes that the drained batteries of the Philae lander might recharge as sunlight levels increased—and this has in fact occurred. Philae has sent a few spurious signals to be relayed to Earth by the orbiting Rosetta. So far, though, intermittent pings are all that have come from the comet's surface. Mission operators are still hopeful that Philae may yet deliver more data, but since the comet and its two tag-along spacecraft are moving farther from the sun each day, the chances will diminish with the sunlight. Still, Philae obtained very useful data from its instruments upon landing and, as it turned out, during a couple of slow-speed "hops" it made after inadvertently bouncing off of its initial landing spot. Philae lighted upon two other locations before finally coming to rest at a site named Abydos. Rosetta will continue observing comet C-G's activity in the aftermath of its solar close encounter, studying the effects of post-perihelion retreat as the comet cools and heads back to the other end of its orbit, aphelion—just beyond the orbit of Jupiter.